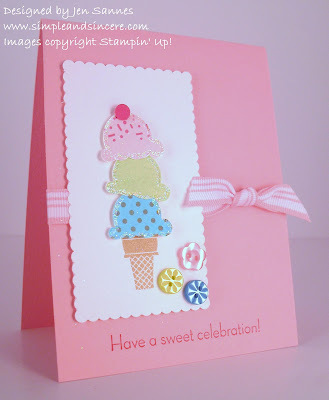 This week's Clean and Simple challenge on Splitcoast is an inspiration challenge, using the Candy Crate's Retro Candy Store to tickle one's designing fancy. As soon as I saw the challenge, I knew I wanted to use my brand spankin' new sneak peek set - Sweet Scoops. This set will be available in a future catalog, but I was itching to break it out. I even found something called Yum Yum Marshmallow Cones in the Retro Candy Store. How fun! I had lots of fun layering all of my scoops and you may notice that they are a little lopsided - that is one purpose! LOL! Have you ever eaten a triple-dipped cone and had it stay in pristine condition? Didn't think so. :) I also added a little Dazzling Diamonds to each of my scoops, just to give it that little somethin' somethin'. Love it! I hope your week is off to a good start. I'm hoping mine begins improving quickly! My kids seem to have had some kind of relapse and both were complaining of not feeling good yesterday. Plus we supposedly have a snow storm headed our way? Lovely! Good stamping weather, huh? Hope to see you back here soon - 'bye for now! Such a fun card! And this set looks so fun!!! Thanks for sharing! Omigosh.......this is sooooo cute! Can hardly wait for the pre-order.........this will be a definite for me lol. My hubby works for Schwans and anything with ice cream is a must!